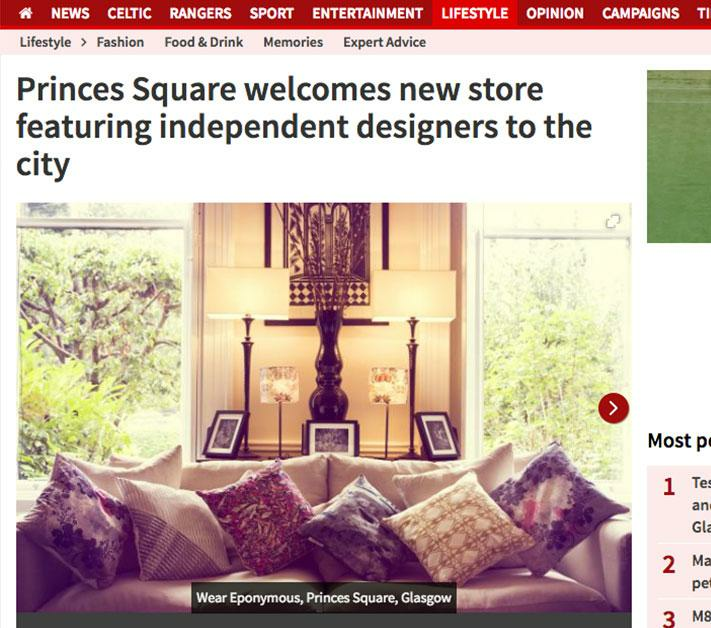 A ONE-STOP lifestyle shop, the newly opened Wear Eponymous in Princes Square, Glasgow, brings selection of unique and independent designers to the city. Set up two years ago by Alan Armitage and Elaine Burns, the selection of clothing, accessories and home furnishings was only available online. After setting up two successful pop-up shops in Glasgow Fort and Princes Square, the business is branching out with its first store in the Buchanan Street shopping centre. Among the highlights are VVA Handbags, a selection of bags and handbags made from Harris Tweed by Catherine Aitken, and Amy McGregor Lifestyle, including lampshades, cushions and prints. "We curate high-quality independent brands, they key is accessible luxury," explains Alan, who previously worked in IT. "We're hoping to build up the lifestyle side over the next year or so. That will have a big influence on the website as well. We constantly keep an eye on new designers. The idea is to make it inclusive for people." The multi award-winning Wear Eponymous is passionate about finding emerging talent and up-and-coming designers, giving them the platform they deserve to be discovered. Providing unique, artisan products that cannot be found on the high street, the store showcases up and coming designers from Scotland and beyond. "The level of craftsmanship that goes into their products is so inspiring and will offer Glasgow shoppers an interesting alternative in a prime city centre location," adds Alan. "New designers never seem to be given a chance, so we work with them to bring them onto the high street without them facing the daunting task of taking on a lease. We are focusing on the retail side to allow the designer to concentrate on what they do best – creating their products."